The new Tool time! Ever watch Tim Allen's tool time show? This is CBS version of that. Except ours is funner. 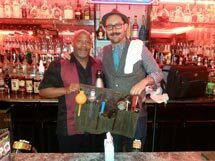 Here i am with the mixologist tool genius Joey, mixologist at The Society lounge!